Tree silhouette 14: This is the last tree silhouette photograph that I am showing for the time being. The best time to photograph tree silhouettes is winter, of which I do not want to be remembered anymore now. The silhouette above is an exception in at least two ways: It only shows a leaf of a tree and the photograph was not taken in winter. 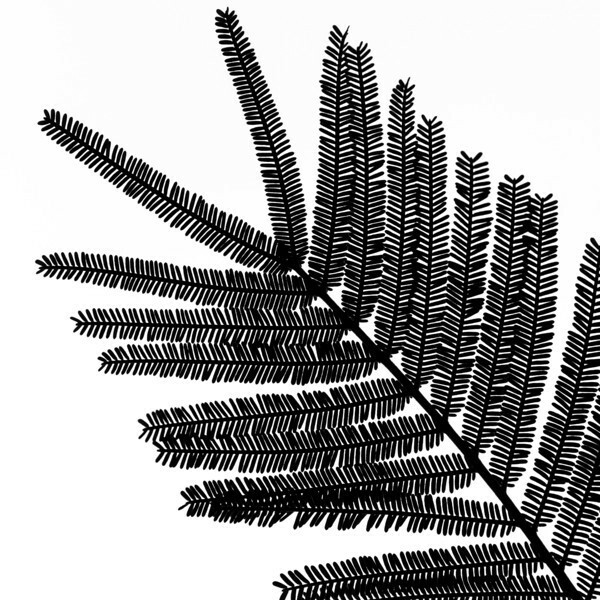 I was intrigued by the delicate, pinnate leafs of Acacia dealbata (silver wattle), whose beauty, I think, is nicely captured in this simple, black and white silhouette composition. I hope you have enjoyed the tree silhouette contributions and as a farewell I also include a slideshow of all 14 photographs that have been shown here. When Florian wrote a feature on my wildlife photography in his “Photo Treasures” section, he also invited me to write a few articles on wildlife photography as a guest contributor. At that time, I was extremely busy with sorting and editing the 28 000+ photos I’d taken on a 33-day trip to Ecuador but, now that its almost done, I thought I would start my first article where Florian left off and take a closer look at one of my favourite families of birds: the Hummingbirds. 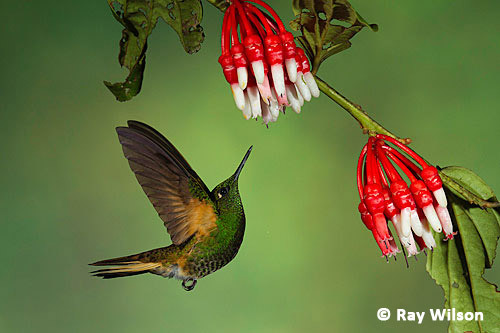 So why the interest in hummingbirds? It is hard to decide where to begin. They are fascinating in so many aspects of their biology... 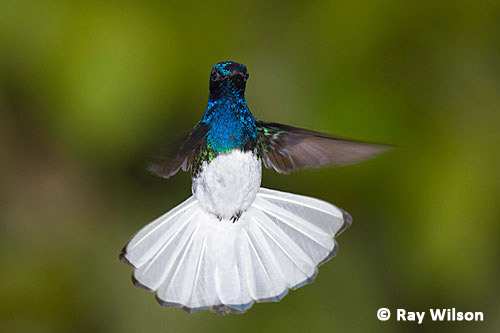 The Troichilidae, which is the scientific name for the family to which the hummingbirds belong, is an incredibly diverse family with 314 species recognised by the recently completed Handbook of the Birds of the World, making it the second most species rich family in the world behind the Tyrant Flycatcher (Tyrannidae). They are found exclusively in the Americas, with the vast majority living in Central and South America and only a handful of species venturing into North America. But it is not the sheer number of species that draws most people to hummingbirds. It is their extreme mastery of flight and their beautiful iridescent plumage. Through a number of unique anatomical adaptations, which allow them to generate lift on the upstroke as well as the down stroke, hummingbirds not only have the ability to hover for prolonged periods with millimetre precision, but are also the only birds in the world capable of flying backwards. 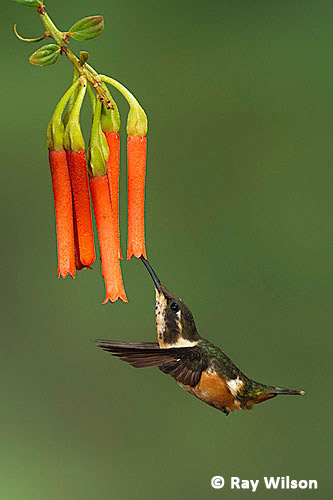 Hovering, as a mode of flight, is very energy demanding and most hummingbirds need to consume about 1.6 times their body weight in nectar every day, supplemented by hawking for small insects to boost their protein intake. Even at rest, the hummingbird’s metabolic rate ticks along at a mind-bendingly fast rate. For example, their resting heartbeat is thumping away at between 300-500 beats per minute, rising to 1 000 beats per minute during bouts of hovering and aggressive display. To pump enough oxygen into their bloodstream to fuel such a high metabolic rate, they have to breath extremely quickly too, taking around 200 breaths per minute (in comparison, humans have an average resting heartbeat of 60-70 beats per minute and breathe 14-18 times a minute). Obviously, if you are going to spend a large portion of your life hovering, keeping your weight down to a minimum is advantageous and the hummingbirds have taken miniaturisation to an extreme. The woodstars are a good example: At only 4.5-6 cm in length, measured from the tip of their bill to the tip of their tail, and weighing only 1-2 g, they are no bigger than many of the large bees that inhabit tropical South America. With their wings beating at an incredible 60-80 beats per second, their mode of flight is also extremely reminiscent of a large bee. 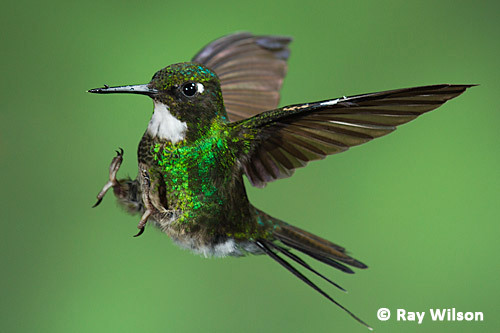 One last fact: recorded flight speeds of hummingbirds are among the fastest of all birds. In level flight, Green Violet-ears have been measured at 96 kph, almost 50% faster than the fastest homing pigeon! But even that pales into insignificance to the Ruby-throated Hummingbird of eastern North America, which reaches a staggering 200 kph (125 mph) during its display flights! The following thoughts were initiated by a recent experience at work where somebody had difficulties choosing what to present and what to leave out. Although this situation had nothing to do with photographs, it is just as relevant in photography and in many other aspects of our daily lives as well. It is important to choose, to be choosy and to leave out. Have you ever seen a man wearing ten precious designer watches on each arm? Or did you ever have the chance to admire a women's ear with all of her most sparkling and beautiful earrings on display? Or did you ever watch a movie with seven different endings and 13 main characters? Most likely not. Besides the impracticability of wearing 20 watches, beauty only exists in isolation. It is impossible to appreciate the beauty of a single piece of jewelry in a treasure chamber or an interesting movie plot amongst all possible parallel universes. This blog post is of course not about watches, earrings or movies, but about photography. On one hand, you cannot use several lenses or cameras at once - a reason why I am an advocate of moderation when it comes to equipment. On the other hand, you cannot photograph multiple subjects simultaneously (you can of course, but in my opinion your photograph will be difficult to appreciate). Finally, you also have to be choosy when it comes to selecting and editing your photographs. Before photographing a scene, decide what you want to capture. For a wildlife or wildflower photographer, the gist is obvious, but subjects worth recording on a memory card may also be a particular quality of light, a color, a structure or pattern. In either case, your goal as a photographer should be to emphasize and isolate the core of your photograph. Choose what you want to photograph, isolate the main subject and emphasize the essence of your capture by arranging the elements of your composition. You have to choose and to be choosy! "M" - A simple composition from the Drapes & blinds gallery. I have several versions of this photograph - this is the most "intimate" and my preferred composition. 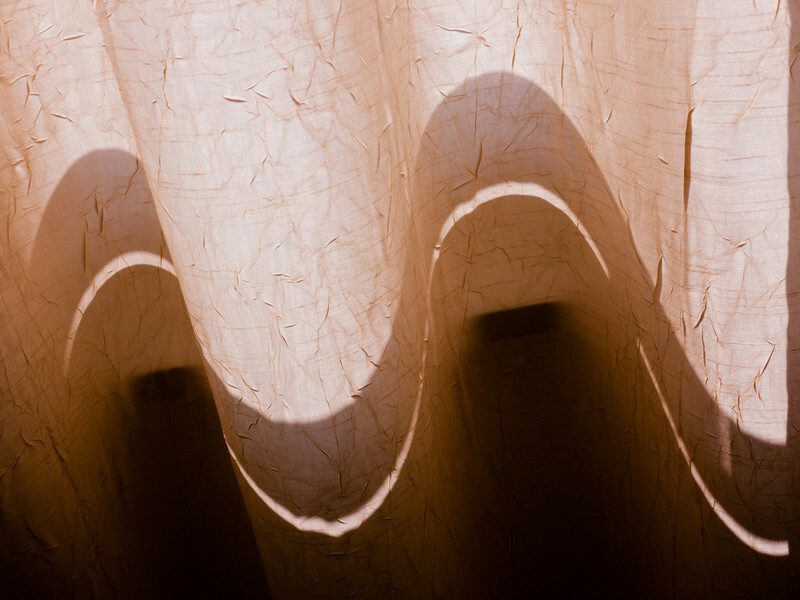 Obviously, I have been fascinated by the waving pattern of the shadows that the morning light paints on this curtain. A simple and minimalistic carcolor composition. Although it lacks color and flashiness, I find the harmonious colors and zigzag line of "teeth" - reflections of brightly illuminated parts of a building facade - aesthetically pleasing. 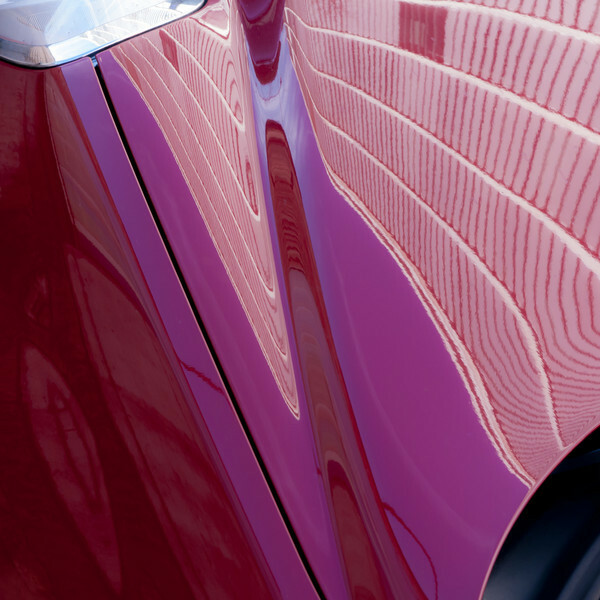 In contrast to the majority of the carcolor photographs, this facade was distorted and reflected in a light-colored car. In general, it is much easier to find contrasty and interesting reflections in dark car bodies. Convince yourself by looking at the carcolor compositions that were introduced in earlier posts! This is another "unfitting" blog post, because it is not about photography or a photographer, but about "another" artist: this is a new contribution to the "my treasures" collection. The previous texts in this category - about Ueli Lüthi, Rudolf Mirer and Jacques Rime - have been very successful and are among the most visited posts. Today's treasure introduces Robert Hainard, who was a natural artist, writer and philosopher from the french speaking part of Switzerland. In contrast to all previously highlighted artists, including photographers, Robert Hainard is not alive anymore - he died in 1999 at the age of 93. 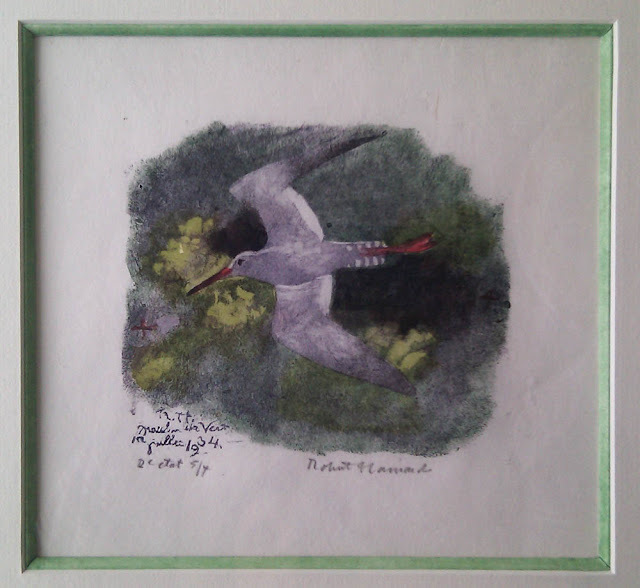 Rober Hainard studied art and is known for his drawings, wood and stone sculptures and most importantly his xylographs. 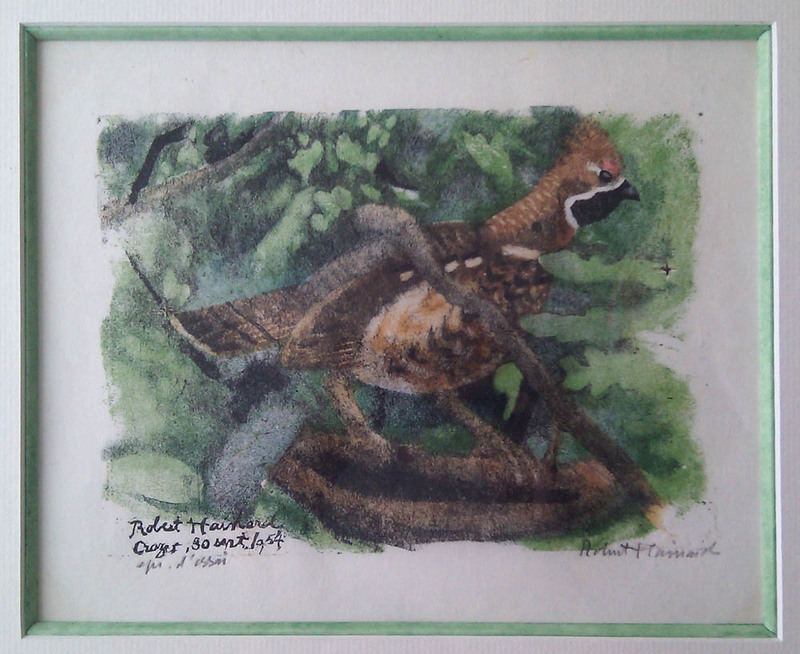 He invented a method to create multi-colored woodcuts of animals and wildflowers. Robert Hainard observed his subjects in the wild and carved one wooden plate for each color of the final print (he used up to 14 plates per image). Different shades of color were obtained by removing more or less wood and the plates had to be carefully aligned (the crosses discernible in the prints help the alignement) and each color was printed separately ontop of each other. To me, these wonderful prints look almost like watercolor paintings and I am amazed at how he managed to imagine the separate images that were required to create the final work of art he envisioned. Robert Hainard was not only an artist who created beautiful prints, sculptures and drawings of animals and plants. His inspiration came from his wanderings around Geneva, where he lived. He created his works of art based on the drawings of his observations and his memories and impressions of his excursions. An intact natural environment was therefore very important to Robert Hainard and he was an early voice that tried to remind us of the value and beauty of nature. Some of his ideas are nicely expressed in the movie clip below (in french). This is another example of a macro tilt photograph that I have taken recently. Although I could not have taken the photograph as it is shown here without the tilt function, the effect of the lens movement is not very apparent. 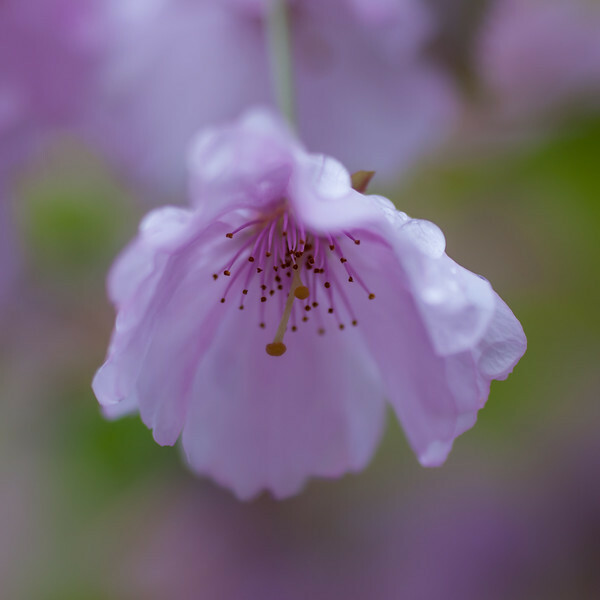 However, the ability to move the focal plane and to take macro photographs with a wide open aperture was one of the main reasons for my interest in the Mirex tilt-shift adapter. I intend to experiment with and practice this type of macro tilt photography extensively this year. Unfortunately, the cherry flowers are already gone for this year (due to one of the many heavy rains of this spring; right after the flowers opened). On a different note, I would like to let you know that Nikon DX lenses (with an additional Canon EF to Nikon adapter) seem to be compatible with the micro four thirds tilt-shift adapter (unlike the Canon EF-S 18-55 lens). I have recently had the chance to quickly try fitting the Nikon 18-55 DX lens onto my newly acquired adapter and I can report that the lens tilts and shifts in all directions as it should. I have not taken any photograph with this camera-adapter-lens combination, but I have no reason to doubt its perfect functionality. I also do not yet know if other Nikon DX lenses fit the Mirex adapter or not, but the possibility is very promising - you could for example "create" a fascinating 11-16 or 12-24 mm tilt-shift zoom lens! Mountain shadow in Krimml, Austria. A photograph recorded on slide film in "pre-memory card times" and when daily backups were impossible. Capitalism and consumerism sometimes bring to light extraordinary products of questionable utility. Just recently, I have come across an electronic fork that records how much and how fast you eat and warns you in case of hasty devouring and gluttony (if you really need to see it, THIS is the link). In contrast, a device that secures and protects the images of millions of photographers by creating backups independently of a computer, a memory card copying machine, does not seem to exist at all! Consider the following: In the year 2012, 10% of all photographs that have ever been taken in the history of photography were recorded (for example, according to TIME). I am certain that only a small percentage of these digital images were backed-up and therefore an enormous number of photographs are certainly lost every day due to memory card malfunctions, theft, loss or other accidents. On a global scale, such losses are completely insignificant, but for the individual photographer it may be devastating and saddening. I still think with melancholy of the photographs of an entire roll of film that was "lost in development" many years ago! At the moment, I am searching for a reliable backup solution that is independent of a computer. Usually, I take rather few photographs and could easily suffice with two or three memory cards for an entire trip. However, I feel uncomfortable having all photographs on only one card all the time. I would like to regularly backup the photographs to a second location (not an online storage service). The perfect solution would be a small device, similar to a card reader, which creates backups on a second memory card or a USB flash drive. Unfortunately, such a memory card copying machine does not seem to exist. The memory card is backed-up daily to a tablet (Motorola XOOM, rooted, but I do not know if rooting is necessary for all tablets). From the Xoom backup, two additional backups on two different USB flash drives are made. As soon as the memory card is full, the backup on the tablet is deleted and the card as well as the two USB memory sticks are stored at three different locations. For this approach all you need is a tablet with USB OTG support (which I will take with me most of the time anyway), an USB OTG cable, a card reader and the USB flash drives. The backups are created with the FolderSync App (other apps may also work, but I have decided on FolderSync and it works perfectly) and the whole procedure worked flawlessly on a recent short trip. I am hopeful that this will be acceptable and reliable on longer trips as well. Do you have better solutions? Or has somebody found a memory card copying machine? Carcolors 26: I have promised to show a photograph that was taken when I discovered the self-portrait featured in the last carcolor blog post. In this photograph, I like the diagonal orientation, the regular pattern of the reflected facade and the white and black corners. This photograph is also a good example for the illusionary depth that is created by such reflections on car bodies. Other examples have been shown in earlier posts and all photographs are also found in the carcolor gallery. Photography has changed tremendously since the times when images were recorded on expensive film and painstakingly developed and printed in the dark room. While it was once mandatory to deliberately and carefully compose a photograph on-site, it seems to become commonplace to record a constant stream of images and to select, edit, crop, and focus at a later point in the digital darkroom. Perspective control is one of the manipulations that can be achieved in the digital darkroom, albeit at the expense of pixels, because cropping will be required. "In the field", perspective can be controlled by using tilt and shift movements of the lens. I am old-fashioned (or just stubborn): I find it much more satisfying to compose a photograph "in the field" and to use the tools of the digital darkroom only for developing my composition. My recent purchase of a tilt-shift adapter enables me to play with "on-site" perspective control. 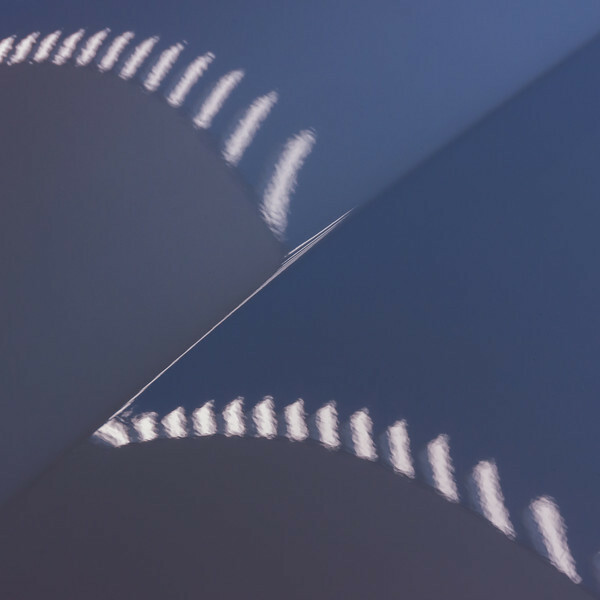 The two photographs above depict light and shadow plays on a facade that I have photographed by looking upward, from rather close-by. A 50 mm lens (on a micro four thirds body) was used and either not shifted at all (left photograph) or shifted 15 mm upwards (right photograph). The two photographs shown side-by-side have not obtained any computational lens corrections whatsoever and are shown as recorded on-site (except for sharpness and global adjustments). Although I knew that shifting the lens upwards is supposed to correct perspective in photographic situations as this one, I was still surprised and fascinated how well it actually worked. The photograph on the right will require almost no perspective control at all!